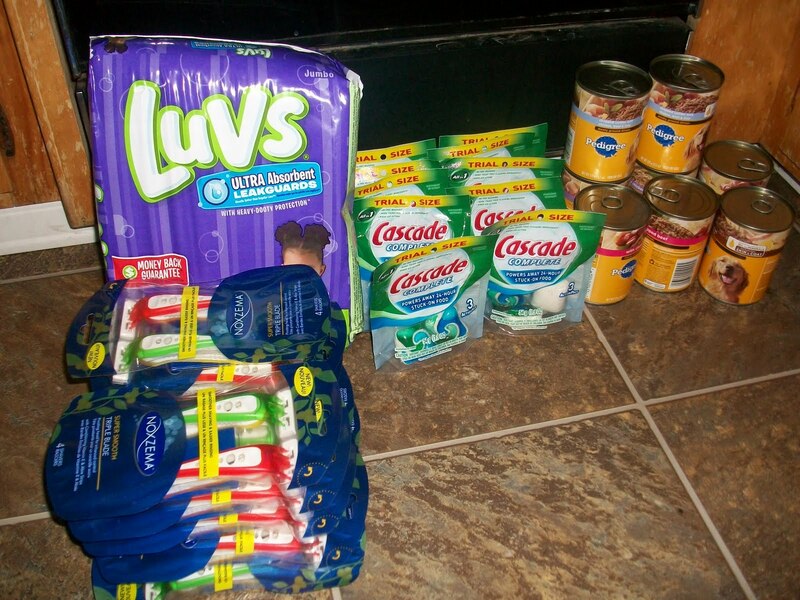 Walmart trip…saved almost 80% with coupons and price matching!!!! Spent $12.44 ( paid $1.80 for the coupons) so total $14.24 technically. Here’s a break down of how I did this…. First of all I saw I noticed that Wal-Mart had Trial size Cascade and I had a dollar off coupon with no size restrictions. I ordered more of these from a coupon clipping service for .08 a piece. (that I also got from a clipping service for .10 each). Rite-Aid has a sale on these this week for $2 (free after coupon) Wal-Mart does price matching so I brought Rite-Aid’s ad. This saved me an extra trip. Pedigree .68 (8) had 4 BOGO coupons so I got four FREE. Luvs Diapers. 6.97 (no coupon) I should have done the diapers in another transaction….if I had the total for just my coupon items it would have only been $5.43!!!!!!!!!!!! Previous postWalmart shopping trip scored 24 bottles of Advil for $3.27!